An endoscope is an imaging tool that can be used to look inside some parts of the body of the horse in order to identify abnormalities using a camera. 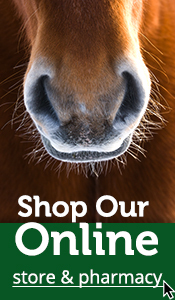 One of the most common reasons for ‘scoping’ a horse is to investigate poor performance or abnormal respiratory noise. It allows our veterinarian to see if the opening of the windpipe is compromised in any way, making it more difficult for the horse to breathe when exercised. The endoscope is passed up one of the horses nostrils, often with the aid of a mild sedative and into the throat. It guides us in determining the severity of a potential problem and treatment. The use of fiberoptic endoscopy in the horse has enhanced our diagnostic capabilities for various other body systems as well, including the gastrointestinal tract, and the reproductive tract. Video endoscopy not only magnifies the structures to make small structures more visible, it also allows you, as the client, to visualize the anatomy as we explain a given problem in your horse.